In this Photoshop Effects tutorial, we're going to take a look at some of Photoshop's more advanced blending options, specifically the "Blend If" sliders. Don't let the word "advanced" scare you off, they're really very easy to use and lots of fun, and not only can they give you much better blending results than anything you could get using the standard layer blend modes, they also give you a lot more control. 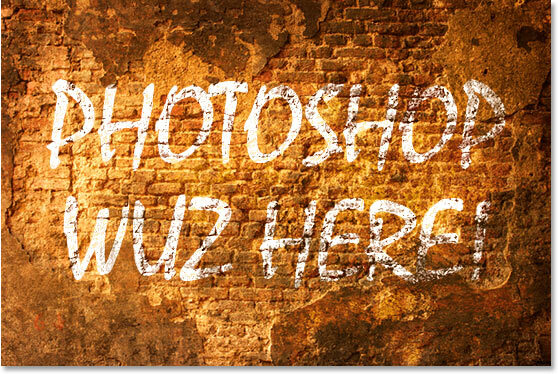 We're going to be using them here to make some simple text look as if it was written on the wall behind it, but you can use them to blend any two images together for both realistic or creative effects, and as we'll see in this tutorial, using them is as easy as dragging a couple of sliders left and right. This Advanced Blending tutorial is from our Photo Effects collection. Let's get started! Photoshop's Layers palette showing the original image on the Background layer and the type layer above it. The original image with the text above it. 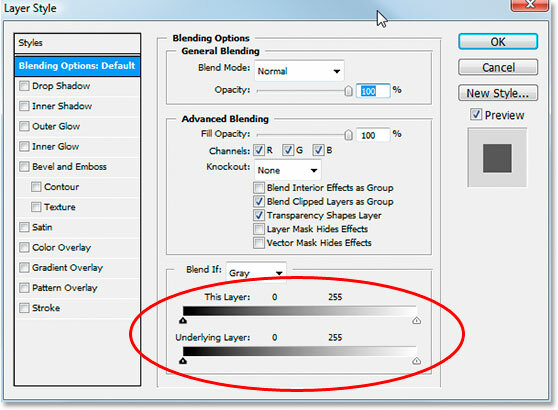 Select the Blending Options from the top of the layer styles list. The Layer Style dialog box with the "Blend If" sliders in the bottom center. Photoshop's Blend If slider bars in the Blending Options. There's two Blend If slider bars, and if you're not familiar with them, you're probably thinking they look identical, and you'd be right. They both have a gradient inside them running from black on the left to white on the right, and they both have little black and white sliders on either end. But while they both look the same, they do slightly different things. If you look closely, you'll see "This Layer" written above the top slider bar, and "Underlying Layer" written above the bottom one. The bar on top affects the layer you currently have selected in the Layers palette. The bottom bar is a bit misleading though because while it says "Underlying Layer", it really affects every layer below the currently selected layer. In my case here I only have one layer, my Background layer, below my type layer, but if I had more than one layer below my type layer, it would look at all of them, not just the one. As I mentioned, both bars may look the same, but there's a slight difference between them. Moving the black and white sliders for the bar on top will cause areas of the currently selected layer to disappear from view. Moving the sliders for the bar on the bottom will cause areas of the layer(s) below the currently selected layer to show through the selected layer, as if it's punching holes through the layer. In other words, since I had my type layer selected, if I move the sliders on the top bar in towards the center, I'll be making areas in my type disappear. If I move the bottom bar's sliders in towards the center, I'll be making areas of my brick wall photo show through my type. Moving the white slider affects the lightest areas in the image, and moving the black slider affects the darkest areas. The further I move the sliders, the greater the tonal range that's affected. Dragging the bottom Blend If black slider to the right. The darker areas in the brick wall photo are now showing through my text. That looks pretty good already, but there's a problem. The areas where the brick wall is showing through the type are too harsh. It's either the text showing 100% or the wall behind it showing 100%. I need more of a subtle transition between the two to smooth things out and make it look more realistic, and I'll do that next. Hold down Alt (Win) / Option (Mac) to split the sliders in half and create smooth transitions in the blending. The image after moving and adjusting the bottom black slider. 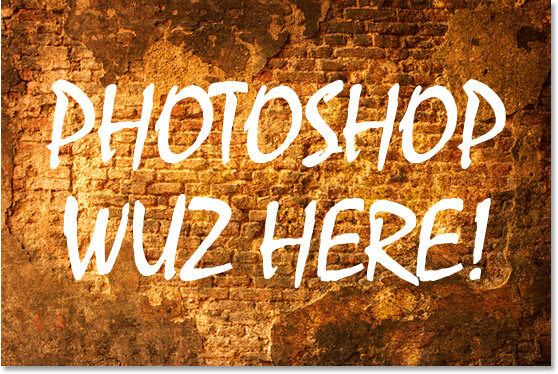 Dragging the bottom white slider to cause some of the lighter areas in the brick wall photo to show through the text. Holding down Alt (Win) /Option (Mac) to split the white slider in half and drag the right half back towards the right. And there we have it! That's a look at how to create some advanced blending effects using the Blend If sliders in Photoshop! Visit our Photo Effects section for more Photoshop effects tutorials!